You wouldn't start off on a long road trip without checking your car’s oil, so why wouldn’t you put the same amount of maintenance into maintaining your heater? The systems that heat our homes are generally very reliable. However, that doesn't mean that they will stay in working condition if we ignore them. Prescott Air Conditioning recommends that you follow these guidelines when maintaining your Prescott heating system. No matter what kind of heating system you have, it’s always a good idea to start at the thermostat. If your system is starting and stopping a lot, your thermostat might not be adjusted properly or might be broken. Starting and stopping your heater is a lot like starting and stopping your car: it wears it out much more quickly. Adjusting your thermostat, or purchasing a higher quality thermostat, if needed, is a great way to both maintain your heating system, and potentially save money in the winter. Next, it’s always a good idea to check your air filter. Generally, we recommend you check your filter for debris and tears once every month, and replace it every 3 months. If you have asthma or pets you should generally check and replace your air filter more. When you do go to change your air filter, Prescott Air Conditioning recommends getting and high efficiency pleated air filter. These air filters cost a bit more, but will overall increase the longevity of your heating system and the quality of the air that comes out of it. Next, the parts of your heating system that come after the filter come next. We recommend calling us at least once a year for a checkup, for mold, rust, and dust buildup. These can decrease the quality of air that comes out of your vents as well as become a fire or health hazard if left too long. If you start noticing a “musty” smell coming out of your vents, schedule a professional inspection immediately. The heater blower is responsible for the actual movement of air inside your heating system. 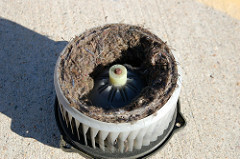 If you notice a lack of airflow, it might be a good idea to have your blower serviced. Changing the blower belt, cleaning the fan blades and blower housing, and oiling the fan bearings are all easy and inexpensive ways to make sure that your heating system is pumping out as much air as it needs to. As for the heater itself, if your heater pulls air from outside, or is outside itself, make sure it has at least 2 feet of space around it and is free from grass and leaves. If you have an indoor heater, make sure that there are no large objects that could be obstructing the flow of air or trapping heat. Contact us to come in between every year and every two years to make sure that your heater is free of any soot build up, and make sure that your gas valves are tuned. Finally, make sure that your carbon monoxide detectors are correctly installed and have a fresh battery Most carbon monoxide testers will be able to use a single battery anywhere from a year to two years, so it is a good idea to change it once a year. When we come to your home for furnace maintenance, we test your flue (exhaust) for gases to see if they are at risk for being harmful. Combustion and emission testing is a very important step in heater maintenance, as it can determine if there if the burner is producing harmful gasses or burning improperly. Heater maintenance is a very important part of being a homeowner, and neglecting that could have dangerous consequences, both for your health and for your wallet. By following these simple steps, as well as regularly having Prescott Air Conditioning and Heating Repair come out and check your heater, you can save yourself having to buy a new heater! We can help you with your maintenance and save you the headache that comes with it. Give us a call at 928-308-1254 today to schedule a professionally qualified, certified technician to perform maintenance on your heater.